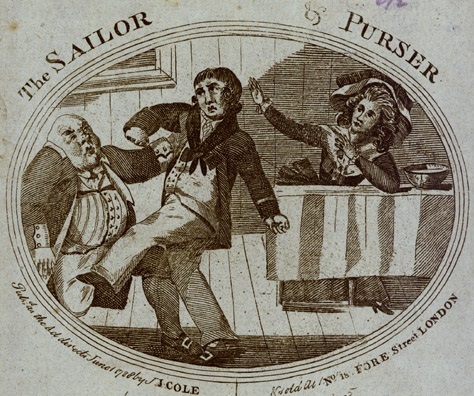 The Sailor & Purser, J. Cole, 1788, Washington State University 18th Century Street Ballads. 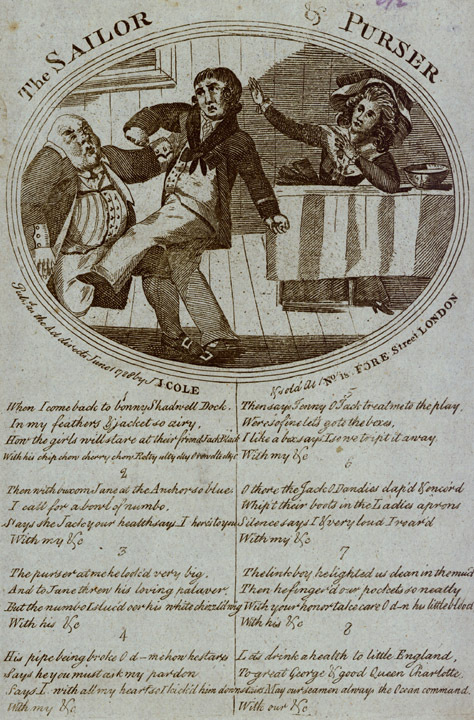 Jack Black, the common tar in this broadside, loses his cool when the ship's purser makes a pass at "buxom Jane" while Jack entertains her at the sign of the Anchor. If not for the explicitly printed date of 1788, I would think this piece was late. Jack's neckcloth is hanging very low, and tied in an odd bow. His trousers also drag below his feet in a manner I've only ever seen at my esteemed brother blogger's site Napoleonic Tars: 1790-1820. The style appears to be one popular in the 1810's, and this is the first I've seen of it in my era of study. He wears his hair short and curled, with a double breasted white waistcoat, a checked shirt, and a jacket that ends about the top of the thigh.